It’s probably safe to say that suede boots and winter weather will never be the best of bedfellows. Which of course makes it painfully ironic that the colder months of the year are exactly the months during which stylish suede boots can be used to bring together a thousand and one autumn and winter looks. Living in the UK, if you were to only ever dress in accordance with the weather, you’d end up wearing the same dull outfit about 300 days out of every 365. 1 – Seal it, Seal it Well! First and foremost, there are two extremely important things to remember when it comes to sealing suede boots. First of all, you cannot and will not get away with NOT sealing your boots…it’s as simple as that. As robust and durable as it may be, unsealed suede just doesn’t stand a chance against the winter weather. Secondly, there’s an enormous difference between the bargain-basement 49p sealing products on the market right now and those that cost closer to £5 or even £10. It might seem like a big difference in price, but the primary difference between such products is that those on the latter end of the scale actually tend to work. 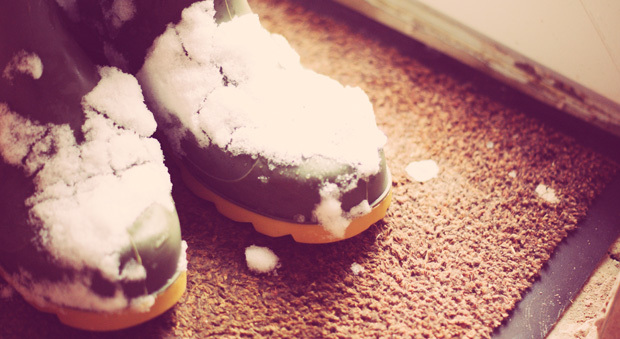 If you get any kind of liquid on your boots you’d rather get rid of…as in something other than rain/water…try dabbing the area well and then adding a thin layer of talcum powder. Leave this on for about 12 hours and then take a suede brush to the area, brushing away the powder. More often than not, this will pull the moisture right out of the fabric and leave barely a trace behind. If on the other hand you find yourself looking at any stains that have already been given the chance to dry in, white vinegar can work a treat. Simply rub off as much of the excess dirt as possible, before applying white vinegar to a clean towel and blotting the stain for a minute or so. You should see the stain disappearing pretty quickly, but feel free to keep at it if it takes some time. This is particularly effective against salt and water stains – perfect for the winter. By this stage in time, you should probably have heard plenty of hype about just how fantastic the humble toothbrush can be when it comes to breathing life back into your suede boots – and all other suede garments for that matter. Try a dry toothbrush first and if this doesn’t work, hold the offending garment over a steaming kettle or pan of water for a few seconds and then have another go at it. In terms of the kinds of things you should most certainly NOT be doing in the fight to keep your boots as pristine as possible, never fall into the trap of using water to clean suede. It seems like the obvious choice – pure, gentle water that can’t possibly harm such robust boots. In reality however, water can have a marked and wholly undesirable effect on both the texture and the colour of suede, so you might want to think twice about giving them the odd rinse, every now and again. Last but not least, actually taking yourshoes to the professionals to have them cleaned and spruced up is something of a dying practice these days – at least in the United Kingdom where far too many people see shoes as disposable commodities. Whichever way you look at it, there is simply no sense in calling it quits with a pair of suede boots you’re still somewhat in love with, rather than paying no more than a few quid to have them professionally cleaned. And if you’ve never had your boots professionally cleaned before, rest assured you are in for a surprise – they’ll probably come out every bit as good as new!